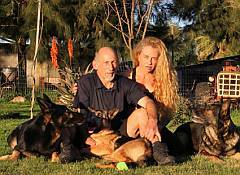 Hennie and M-j have been involved with GSD's and other animals for over 20 years. 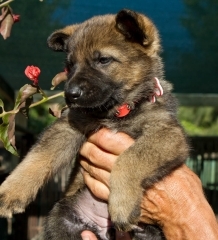 We treasure the German Shepherd's loyalty, intelligence and devotion. They are extremely courageous, versatile, with strong protective instincts, and excel at almost anything that they are trained to do. They are highly driven, athletic, energetic, and exceedingly eager to learn. They crave a good challenge. 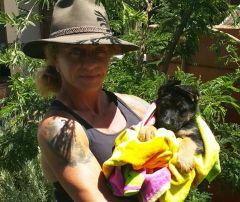 One of the most capable and trainable breeds in all of the dog kingdom, an ideal German Shepherd when well trained by a confident owner, is a magnificent companion. 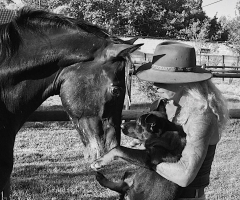 Our dogs are true quality, bred, showed and worked with dedication and love. Our aim is to breed beautiful dogs with sound temperaments, suitable for protection, and devoted family companions. Delivery can be arranged at buyer's cost. Puppies can be flown to major airports. 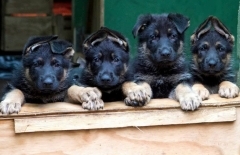 We are members of the German Shepherd Federation and adhere to their breeding restrictions. We are also members of KUSA. Puppies may be registered with either registry. Our puppies are tattooed with their registration number.